If you like Neilmed on Facebook via this link and enter your details they will send you a free Neilmed Sinus Rinse bottle and two free sachets. I got one of these a while ago when they had an offer like this and they're actually really good. You use them to clean out your sinuses using a solution you make by mixing the contents of the sachet with luke warm water, and it's actually a really nice feeling. Great for when you've got a cold or a blocked nose for any reason. Your free product NASAFLO NETI POT will be delivered within 30 business days to the below address. Below is your quiz result. 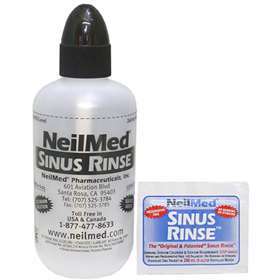 Become a fan of NeilMed Sinus Rinse and NeilMed Neti Pot on Facebook and be part of the world leader in nasal irrigation system. Visit NeilMed Promotions to know about the latest promotions and offers currently available at your local stores and online.